The Fortress Respiratory Protector can process up to 50 CFM of air through a four stage filtration system. Stage One and Two remove moisture, oil mist and particulates. Stage Three removes odors through an activated charcoal bed and Stage Four converts small amounts of Carbon Monoxide to Carbon Dioxide through patented technology. A built-in Carbon Monoxide monitor, powered by multiple sources, samples the air for residual CO and will alarm if the volume exceeds allowable levels. The durable, plastic, safety orange enclosure provides portability or mounting capability and protects the components from the elements. 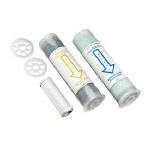 Blast-It-All® carries the following replacement filter kit for use with our Fortress Respiratory Protector. 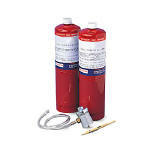 Grade D quality breathing-air at minimum pressure required by respirator and maximum pressure of 125psi. 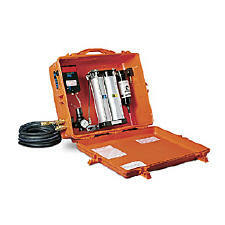 Keep your Fortress Respiratory Protector functioning properly with our Fortress Calibration Kit.